Houston, TX (October 2, 2012) — Early Monday morning, 71,010 Shell employees received an email from the company's "Grassroots Employee Empowerment Division" providing information on Kiobel v. Royal Dutch Petroleum, a pivotal human rights case being argued in the U.S. Supreme Court. The email contained links to news stories, as well as a tool to help employees tweet their feelings about the case at key US news anchors (and Oprah Winfrey). 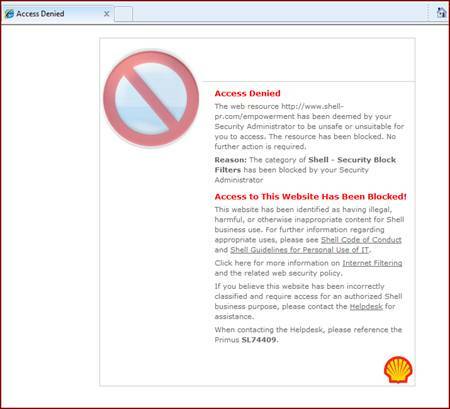 Within minutes of the email being sent out, Shell internally blocked the site, preventing employees from accessing it.